Download Fist Fight in Digital HD from the iTunes store. Fist Fight images are © Warner Bros.. All Rights Reserved. Parking lot. After school. 3pm. Think you've seen it? Think again. 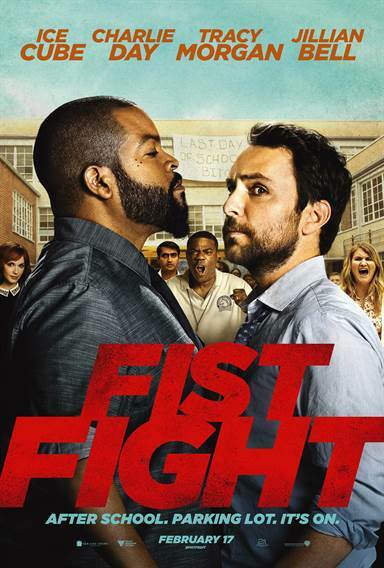 Fist Fight stars Ice Cube (Boys n the Hood; Friday) and Charlie Day (Horrible Bosses; It's Always Sunny in Philadelphia) as high school teachers readying to draw fists at the end of the day. Directed by Richie Keen (It's Always Sunny in Philadelphia), Fist Fight is a very funny take with a few subtle statements along the way. The film makes sure to maintain its patience out of the gate. There's a lot going on when teacher Andy Campbell (Day) walks through the doors on the last day of school (being married to a public school teacher, the look on his face and those words muttered under his breath are all too familiar). It's the last day of school, and Campbell is just looking to make it to the end of the school year that's just a few short hours away. What could possibly go wrong? In spite of the action, the film feels as if it's slowly easing into itself. Yet, the laughter is fairly immediate and continues throughout the film. Charlie Day and Ice Cube (as Ron Strickland) strut their comedic timing, and elevate physical comedy above mere slapstick. Given their talent, and the enjoyable chemistry shared on screen, it was long overdue that these two be paired up. Memorable lines scattered throughout the film inevitably provoke audible laughter, and they don't all come from Day and Cube. Not to take away from these two (back on them shortly), but I can't continue without mentioning Jillian Bell (22 Jumpstreet; Workaholics). How is she not a household name by now? Bell as Counselor Holly has many of the most memorable lines sure to be quoted in perpetuity. Make no mistake, Bell's presence does not rely solely on the delivery of the writer's work. Scene after scene in which she appears, her mere presence is enough. A straight stare can bring you to laugh, but it's the nuances, such as when Day questions her use of meth, that highlight her comedic prowess. Sure, Kym Whitley (I Love You, Man; Black Dynamite) as a 911 operator gets a lot of trailer play, but that's not even the funniest part/line of the movie. The trailer is fun and funny. All too often, we're hooked by the trailer only to arrive in the theater and discover that we have already seen the best of the the movie... the funniest lines... the most attention-grabbing scenes. Not here. The film delivers far more than the trailer has to offer. Tracy Morgan (30 Rock; Saturday Night Live) as Coach Rawlins coaches Campbell in more than just schoolyard fights with a sincerity that exists in, though might not be expected, of our educators. Morgan brings his brand of funny, keeping things safe but solid in his first film role following his 2014 crash. Kumail Najiani (Silicon Valley) stays true to character with very real life like quotes spun into a dry, ironic humor, while Christina Hendricks (Mad Men; Drive) goes a little too over the top in her darkly humorous role. Alexa Nisenson (Middle School: The Worst Years of My Life) is charmingly delightful in her turn as Campbell's daughter. She appears throughout the film - her focus on her school talent show performance (which WILL NOT disappoint and is certain to make some parents proud). This is not a message movie, and having one will not throw a bucket of ice on this hilariously entertaining film. However, amidst the laughter are some harsh realities. There's the sensationalism created by social media and the phenomenon of posting fights. From the hype surrounding the event (#fistfight frenzy builds throughout the film, extending far outside the school itself) to the actual event, everyone is drawn in. 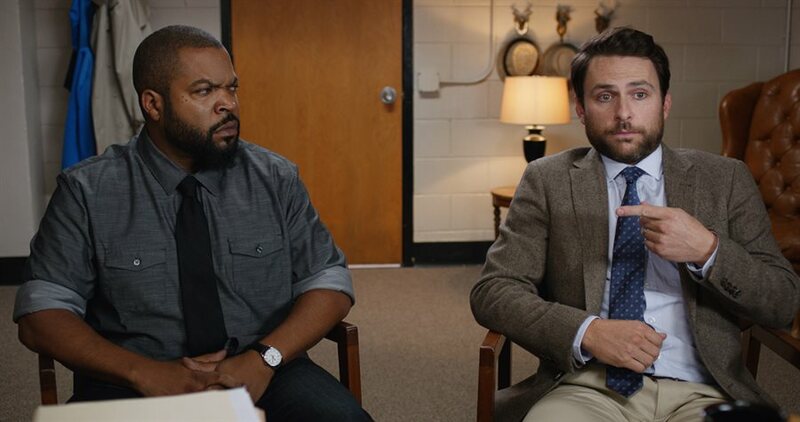 Ice Cube and Charlie Day capture the essence of educators that has been broken down by the system and the limitations placed upon instructors. While their characters appear to be incredibly different people, they are quite alike. At the very core, they are both passionate teachers committed and devoted to making a difference and reaching their students. It is an admirable quality all too often diminished by the testing metrics being applied with broad strokes, and the very real possibility of losing one's job. The anger, hostility and, ultimately, the fight, are the culmination of two peers pitted against each other by the administrative puppets of education. Dean Norris (Breaking Bad) and Dennis Haysbert (The Unit) brilliantly satirize the exertion of power over others. They bring hilarity to what would otherwise be great discomfort. Of course, the statements and messages in this movie will be far more evident to those vested in the education system in some manner. Still, they, along with the rest of the audience, will be laughing out loud, putting a hand over their mouths for many a scene, and quoting dialogue for days (years?) to come. Don't be deterred by some "meaning". Laughter is the intention and achievement of this film. It is destined to be one those you pop in when you need to let go and laugh. Fist Fight images © Warner Bros.. All Rights Reserved.